Grape seed extract is a rich source of polyphenols – powerful antioxidants that help the body fight the damaging effects of free radicals. Research has shown that the natural polyphenols and proanthocyanidins found in grape seed are highly bioavailable and provide significantly greater antioxidant protection than vitamins C, E, and beta-carotene. Clinical research shows that supplementation with grape seed extract can reduce free radical damage and the related risk of degenerative diseases while improving overall health. 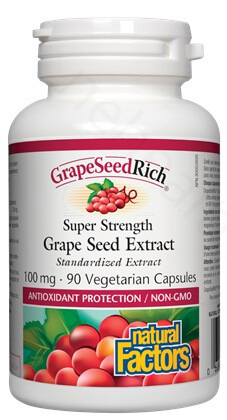 GrapeSeedRich from Natural Factors is a super strength concentrate with standardized extracts of 95% polyphenols and 80% proanthocyanidins. 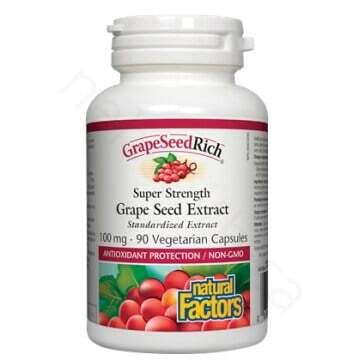 Who Should Use Natural Factors GrapeSeedRich? Other ingredients: rice starch, vegetarian capsule (carbohudrate gum [cellulose], purified water), vegetable grade magnesium stearate (lubricant). Take 1 Capsule 3 times per day or as directed by a health care professional. Jayaprakasha, G. K., R. P. Singh, and K. K. Sakariah. 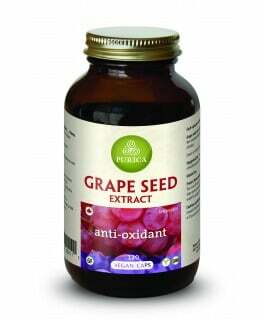 "Antioxidant activity of grape seed (Vitis vinifera) extracts on peroxidation models in vitro." Food Chemistry 73.3 (2001): 285-290. Bagchi, D., et al. "Oxygen free radical scavenging abilities of vitamins C and E, and a grape seed proanthocyanidin extract in vitro." Research Communications in Molecular Pathology and Pharmacology 95.2 (1997): 179.